Closed orders can be accessed by the customer relations team anytime using the "CloseOrder" form. 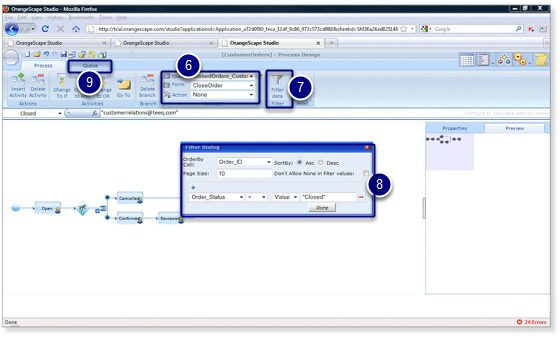 Insert a workflow activity outside the IF conditional branch. Rename this workflow activity as "Closed" by updating the value in the Namebox. Only the customer relations team must be able to close order. Add the customer relations team mail id "customerrelations@teeq.com" in the formula bar. Note: We can use the default queue for this workflow activity. But for the purpose of learning (how to create a queue linked to an activity), we will create a separate queue for this activity. Click on the "+" icon to create a new queue for this activity. Enter the name of the queue in the "New Name" dialog box. Let's name the queue "ClosedOrders". 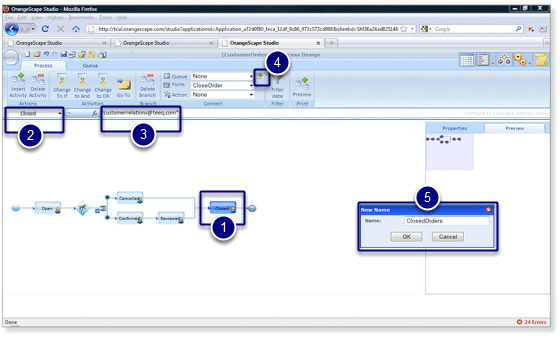 Select the queue and form that must be used for accessing the records in the "Active" workflow state. The newly created queue must be available in the dropdown list for queue. Click on the filter data icon to configure the page size and display order for the list. Click on the "+" button to define filter conditions. Define the conditions in the row added. Click on the queue tab to open the queue design perspective. By default, "S.No", "SheetName", "CreatedAt", "CreatedBy" and "ModifiedBy" fields will be displayed in the queue. Configure the queue to display Order ID, Customer Name, Phone, Email and Modified On. Edit the header display fields by selecting the cell and updating the display name. 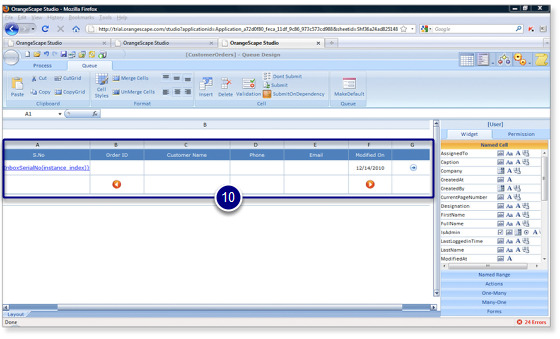 Insert the labels for the above mentioned display fields using the named cell widget. Congratulations! You've implemented the workflow for order process. You should be familiar with inserting a workflow activity, using an IF conditional branching activity and Goto branching activity. In the next section, we will learn to create actions.